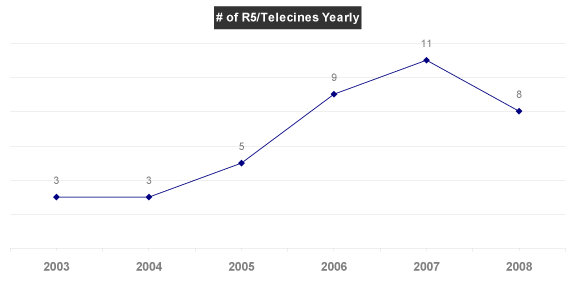 Yesterday, I released six years of piracy data for your bemusement and data munging. But what does it all mean? Well, let’s start with a couple questions. 1. Is the MPAA doing a better job at preventing screeners from leaking online? 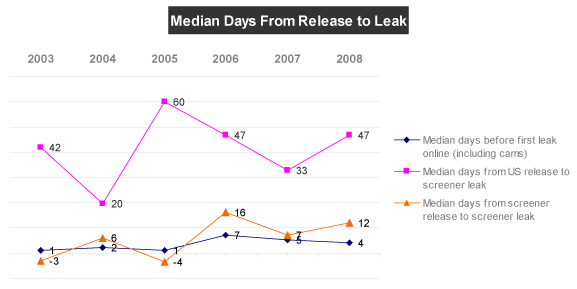 If you look at the chart, it doesn’t seem like much has changed in the time it takes for films to leak online. 2. Is the MPAA preventing overall piracy of Oscar films? No. 148 out of 151 of Oscar-nominated films from 2003 to 2007 were available in DVD quality (either leaked retail or screener DVDs) by Oscar night. The films are getting leaked just as quickly as ever, but apparently not through Academy screeners. This could be because watermarks and recent court cases are acting as an effective deterrent, but I think it’s attributable to two other reasons, which I mentioned in my post yesterday. 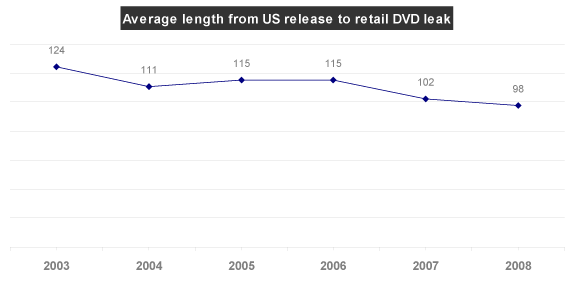 First, the gap between theatrical releases to retail DVD is getting shorter. (Note: I’m going to use the date the retail DVD was leaked as an approximation of the official DVD release date.) In the last five years, it’s gone from an average of about four months to about three months, and continuing to shrink. Screeners aren’t leaking as often, not because the MPAA’s protecting them better, but because they’ve made the whole process moot by providing higher-quality, easier-to-acquire copies before screeners are released, in the form of R5 and retail DVDs. Find anything else interesting in the data? Please, comment or send it to me and I’ll add it to this entry. February 11 Update: The Lars and the Real Girl screener was released. I updated the data. Perhaps you could match these numbers up to the annual home video revenues of various Studios. Very nice work, A litte surprised with result. I’m the same reader who made the R5 remark in the comments with your research last year. I hadn’t been watching the theatrical release vs. retail DVD release trend myself. Your point about these two things making screeners less and less relevant is a good one, and the data backs it up. I was waiting for your research to come out this year — last year’s was a good read and prompted me to watch the trends more closely this year. Thanks especially for releasing the data in a usable format. Actually, I downloaded and watched “The Diving Bell & The Butterfly” a couple weeks ago. However, it was without subtitles, which I’m sure you could find on a third party site fairly easily (if not now, then soon). Although, I can’t imagine how they could subtitle it with all the spelling going on… But just search for “Le Scaphandre et Le Papillon”. Amazing movie by the way. I can’t believe how badly written Afterdawn’s entry on R5 was. Just stating that “by producing higher quality Telecine transferred movies than pirates can offer on the Internet” the studios aim to combat piracy leaves a lot of questions unanswered. Even the obvious ones (“How do they achieve that exactly? Do the studios release R5s commercially once they realize a screener has been pirated?”) don’t sound so obvious on second thought (“If so, why haven’t I seen an R5 sold on my town?”) so they need to be adressed. Fortunately, Wikipedia’s entry on the topic was much more enlightening. The subtitles in Diving Bell correspond to the american spelling of the French words. It’s really weird at first. If going to the movies wasnt such a horrible experience then maybe people wouldnt steal a copy. I cant stand the noise, the kids, the cellphones, the texting and whispering – TALKING and kicking the back of the chairs and just the general stupidity of people in the movies today. They get my money when its available for rental. You ‘released’ the data? Is there anyplace we download the data – I’d love to take a look at it! The spreadsheet’s in this entry.